THE LILLIAN H. SMITH branch of the Toronto Public Library has a long association with children’s literature. Its origins date back to 1922, when the Boys and Girls House Library, the first library in the British Empire aimed exclusively at children, opened. The Boys and Girls House was replaced in 1995 by a new branch, named for Smith, who headed the TPL’s children’s services for 40 years. 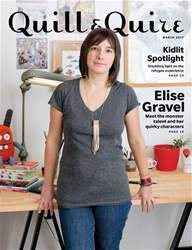 Elise Gravel: Meet the monster talent and her quirky characters. Kidlit Spotlight: Shedding light on the refugee experience.